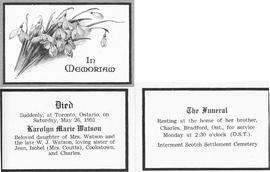 An obituary of Karolyn Marie Watson, who died in Toronto on May 26th of 1951. Karolyn was the daughter of William John Watson and Ida Watson. Her funeral was held at the Interment Scotch Settlement Cemetery. Funeral memorial card for Phoebe A. Harman, wife of Arthur Mousley.